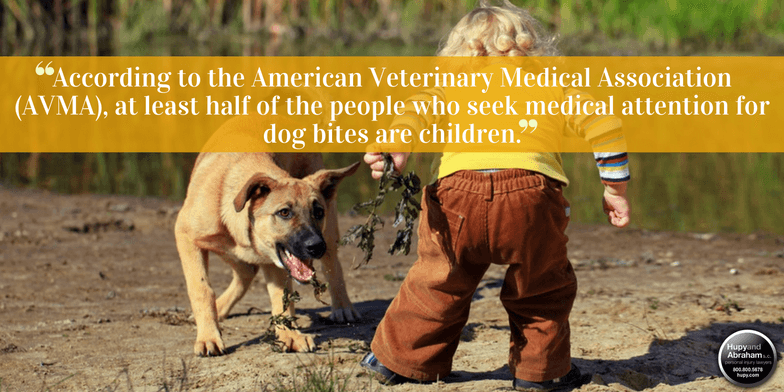 Dog Bite Injuries to Children | Hupy and Abraham, S.C.
You can teach your child to be kind to dogs, to leave dogs alone, and to be calm and quiet near dogs. However, you can’t prevent every potential dog bite injury. Therefore, you need to know what to do if your child is bitten by dog, and you need to take action quickly to protect your child’s physical and financial recoveries. Get your child immediate medical attention. Call 911 or get your child to the hospital or doctor’s office as soon as possible. Perform necessary first aid to stop the bleeding and wash the wound site. While you wait for medical help, you should get a clean towel, apply pressure and elevate the wound site. Report the accident to the local animal control authority. This allows the local government to deal with the dog and dog owner. Get the name and address of the dog’s owner and any witnesses to the incident, if possible. This information will be important when you seek a fair recovery. Being bitten by a dog is a very traumatic experience for a child, and it can also be quite dangerous. Infections. Infections such as staph, strep, Pasteurellosis, and others can create serious and potentially life-threatening situations for dog bite victims. Your child’s doctor will need to diagnose an infection quickly and prescribe the right course of antibiotics as soon as possible to protect your child’s recovery. Post-Traumatic Stress Disorder (PTSD) or emotional trauma. Your child has suffered a trauma and may be fearful or distressed after the dog bite injury. It is important to talk to your child about all of his emotions and to get professional help as needed to help your child through this difficult time. Scarring and disfigurement. Scars can result in physical and emotional pain. Your child may be self-conscious about the scar and worried that people may make unfair judgments based on his appearance. It may be medically impossible to erase all traces of a scar; however, there are medical techniques available to help lessen the appearance of a scar. These procedures may take place over a series of years and may be expensive. It is also important to develop a plan to manage your child’s physical pain which can be substantial in the immediate aftermath of a dog bite. The help that you get for your child now can have a significant impact on his future. Your child is only going to have one chance to reach a fair settlement for his dog bite injuries, and you have a limited time to take legal action. State laws in Wisconsin, Illinois, and Iowa allow your child to recover from the dog’s owner in most instances. That recovery may include compensation for all damages directly related to the dog bite, including but not limited to past and future medical expenses. A fair settlement, or court verdict, requires skilled negotiation and advocacy skills. To find out more about how to get your child the recovery he deserves, please read our FREE dog bite brochure and please start a live chat with us today.